There is only one thing which you can be certain of these days. Trying to keep up with the pace of record breaking and nail biting pieces of data pouring in at the moment carries with it a distinct risk of suffering a heart attack. You shouldn't worry too much about the author of this space though but I am merely pointing towards the fact that 'keeping up' these days is akin to the work of a certain Sisyphus. This time I will be moving in with an addition to my ongoing coverage of Japan; for the most recent posts see here and here. Three, more or less, separate issues will be covered. We will have a look at the traditional charts of domestic consumption and prices and we will also take a look at the situation of the BOJ. What are we likely to see on the interest rate front and equally important how will the economic situation interact with the switch of guards at the BOJ? Lastly, we will look at the Yen and more specifically the USD/JPY. The 105 mark has been well and truly breached and now we are holding our breath for the potential of 100 which will be the real test for intervention. Remember that most of the charts below only go as far as January which of course is somewhat backward looking. I will be adding newer information where applicable. The inflation and subsequent outlook does not seem to have changed much in Japan. 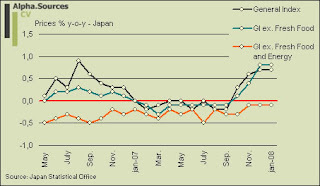 Food and energy still keep the Japanese core inflation in the positive at an annual increase just shy of 1%. The core-of-core index meanwhile remained in negative trajectory. 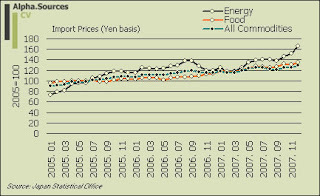 The lack of pass through to prices ex energy and food is a bit surprising at this point but clearly underpins the point that Japan currently is subjected to cost-push inflation rather than demand-pull inflation. I do expect however that prices at some point will move into positive territory even in connection to the core-of-core index. The main point tas always is the extent to which the price increases don't follow the economic dynamics akin to a recovery but rather the resemblance of a supply shock. Essentially, this is all a question of where in the value chain the inflation will show up. So far, companies outside the food sector do not seem to have had the incentive to pass on higher input prices to the extent that these are pushing on margins. In general such a fence won't hold forever of course. Traditional economic dynamics prescribe that this ultimately will end up at the consumers' door either in the form of increasing prices (reduced purchasing power) or cutting of activity which would translate into rising unemployment or an even stronger shift towards part time employment in Japan's case. In this specific context I think it would serve us well to look at some graphs of input prices in the form of import prices and the corporate goods index. We are forecasting that Japan will cling on to a modicum of growth in the Oct-Dec 2007 quarter, boosted by external demand, but there is a possibility that, like the US, that quarter will mark the peak and the economy will retreat in Jan-Mar. Future data for industrial production will tell us if this is the case. Lastly, we also learned a couple of days ago that capital spending was revised down sharply in Q4 confirming my initial hunch at the time that this figure was far outside the realms of reality. 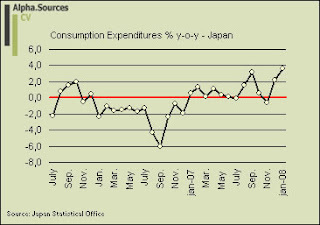 In conclusion, the economic indicators are still pointing towards a significant slowdown in Japan. 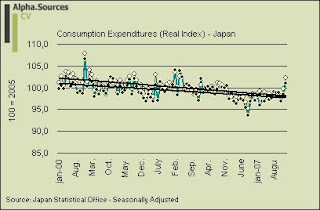 Save the recent pick-up in household spending I have not seen any indications that counters the fundamental point that Japan's much hailed recovery is in for a real test. This then brings us into policy issues and more specifically whether the BOJ is going to move in with a cut in the already pretty trimmed refi rate of 0.5%. The important point to emphasise is that the decision to take it to 0.25% is likely to be just as much a question of politics than economics, at least in the short term. Consequently, and as I have also been pointing to in my previous notes the coming change of guards at the BOJ tend to cloud the setting in which future decisions are to be made not to speak of the decision itself. Japanese politics are not my speciality by any yardstick but the state of play still seems to be the one I have emphasised. The ruling party (the Liberal Democratic Party - LPD) is trailing in the public's glance after a series of political scandals and the opposition (the Democratic Party of Japan - DPJ) who holds the majority in the upper house may want to exploit this by thwarting the LPD's proposal for a governor and thus, most likely, provoking a general election. As Ken Worsley (see link above) details this has led to a number of those backroom negotiations in order to reach a formal agreement in order to avoid a potential rout on open screens. The main conflict is that the LPD's main candidate for the job, the current Deputy Governor Toshiro Muto, is not exactly to the liking of the DPJ. The question now seems to be the extent to which the political parties will risk leaving the BOJ without leadership come the 20th of March when Fukui's mandate expires. I am moving in behind Ken Worsley here as I doubt this would be the case but the risk to this is that the DPJ is bend hell on provoking an election. If this is the case, anything can happen. In the context of what this political charade will mean for policy decisions it is not easy to call, to say the least. Takehiro Sato from Morgan Stanley fields some extensive musings on the topic as he tries to argue why Morgan Stanley still sees the BOJ moving to 0.25% in H01-2008 at the same time as he hedges himself with a handful of put options. The interesting thing is that Sato largely bases his forecast on the extent to which Muto is selected as governor. According to Sato Muto would be more inclined to move in with a cut than the new contester on the arena Former Deputy Governor Yutaka Yamaguchi. All this of course is pretty much speculation at this point. I maintain my view that Q2 2008 will see a cut to 0.25% and behind Sato's hedges I see this as Morgan Stanley's main call too. I think that economic fundamentals will, after all, be the guiding driving force noting alongside Sato that April's Outlook Report (i.e. under the new governor) will be very important in this context. The final topic I promised to deal with was the topic of the Yen and of course more specifically the extent to which we will see intervention in the USD/JPY as the pair drifts towards 100. The myopic focus on the USD/JPY is not really fair. It is important to understand what drives the Yen at the moment which alongside the other low-yielder Mr. CHF is driven by risk sentiment and thus the unwinding/'winding' of carry trade. Carry trade as we know it in the good old days is of course over at this point in time. But the Yen and the CHF still seems to be, for the moment at least, correlated with movements in equities and as such the general risk aversion argument. Obviously, as Macro Man neatly notes in his recent take on the markets the USD is now itself moving in to a territory where it is likely to be used as a funding currency for carry trades, especially since the Yen/CHF funded carry trade is pretty much out at this point even to such an extent that some are worrying about a rapid unwind. With real two year govvy yields of -2.7%, why would anyone in their right mind hold dollars? The carry trade is alive and well (just see where AUD and NZD and BRL are trading!) but this time around, it's funded in dollars and not yen. As Macro Man smugly noted a couple of weeks ago in the context of waiting for ECB's decision to lower rates it might be like Waiting for Godot. I am beginning to think that the same may apply to the USD/JPY and the probability of intervention from the BOJ/MOF. As I have persistently arguing on this point the 100 mark is the real test here. I am not certain that 100 will see intervention but for political as well as more 'animal spirity' reasons I do think that it is pretty close call. Such things are of course impossible to call and we could also ask the question of whether the USD/JPY will hit 100 at all? Given the current momentum against the USD I think this is very likely. In this context, it remains to be seen what a cut to 0.25% would actually do. Fundamental analysis would prescribe that the JPY should weaken on the back of such a move but this is not at all clear at this point. In fact, in the current environment I am not sure that investors are ready to sell the JPY to a great extent an thus revive the carry trade à la traditionelle even if only for a moment. A (short) burst in the form of an equity rally or above par news from the US and (paradoxically) the Japanese economy could bring the USD/JPY back up towards the 110 mark. For the immediate future I see the main bias as supportive for further Yen strength. A lot of ground was covered in this note. The situation and outlook on prices have not changed much since I last had Japan under the spot light. Inflation remains in positive territory driven by energy and food prices whereas the core-of-core continued to decline -0.1% for January. This mismatch is the one to watch for the immediate future. 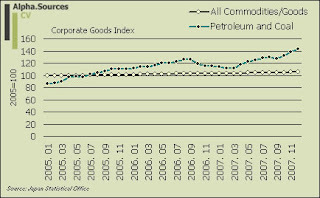 Companies are clearly passing on prices on food and energy price pass through is also given. However, what remains to be seen is the extent to which cost-push inflation will hit a wider array of prices in Japan; so far this has not been the case. Almost all economic indicators are still pointing towards a rather abrupt slowdown in Japan. Only data from household spending and a much welcome increase in wages seem to defy the general tendency. The recent revision of Q4 capex and the slump in industrial production in January confirm my overall bias for a near recessionary environment. In light of this economic environment I see the BOJ cutting to 0.25% in Q2 although I don't think it will happen tomorrow (Friday the 7th). The political quagmire is a potential risk here. All things point towards Muto being appointed unless the DPJ decides to follow through and veto in which case a battle of wills will ensue. In the event of a stalemate I would expect a freeze of policy moves which could shatter my forecast as well as of course a sudden pick-up in economic activity could do the same. 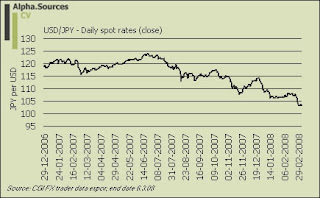 Finally, I took a look at the Yen and more specifically the probability of a USD/JPY intervention at 100. I am not convinced that it would happen but I contend that this is a magic number if ever there was one so this will be a close call. If economic conditions continue to deteriorate I see the probability of intervention increasing as the USD/JPY drifts towards 100. Meanwhile the JPY seems to be driven by risk sentiment and thus the reversal of carry trades. A cut to 0.25% suggests a weakening but I am unsure that the JPY will respond to fundamentals at this juncture.